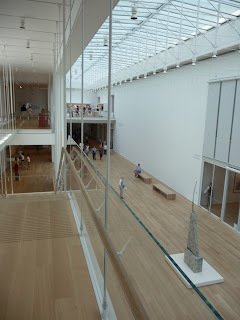 New in Chicago is a newly opened Modern Wing of the Art Institute. 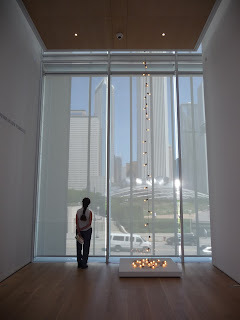 It was very good, among other things, to catch up with what Cy Twombly has been up to over the past decade or so. 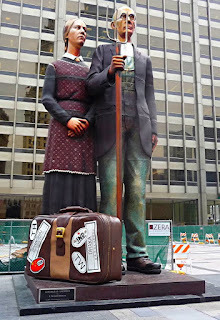 The generous display space being allocated to foreign modern art seems to have triggered a walk-out by two famous Chicagoans since 1930, the Grant Wood American Gothic couple. 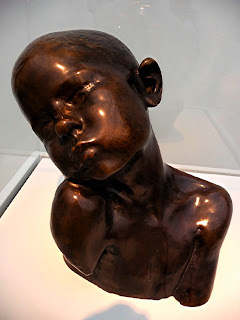 The Art Institute has two fascinating Brancusis — Suffering of 1907 is very clearly the work of someone who worked, even if only for a few weeks, in Rodin’s Paris studio. 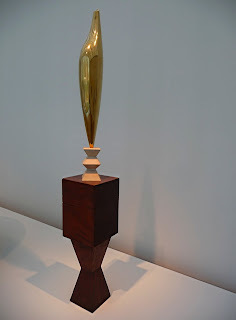 Meanwhile, Brancusi’s slightly chunky but essentially graceful Golden Bird of 1919/20 is a real beauty that wonderfully prefigures his more famous Bird in Space works from the later twenties. 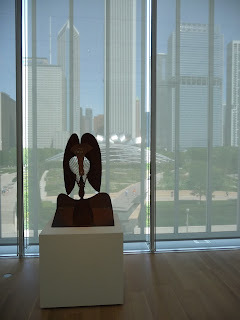 The latter apparently so annoyed a 1920’s dumb literalist / simple materialist customs officer that he refused to acknowledge it could mean anything artistic and reclassified it as an industrial chunk of metal — after all, that was all it could be proved to contain, so what else could there be to it? 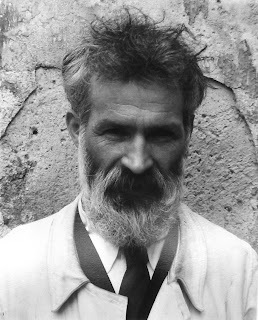 Brancusi himself had a slightly more nuanced and grown-up way of seeing reality that is a challenge to cloth-eared reductionism in every age — Il y a des imbéciles qui définissent mon œuvre comme abstraite, pourtant ce qu'ils qualifient d'abstrait est ce qu'il y a de plus réaliste, ce qui est réel n'est pas l'apparence mais l'idée, l'essence des choses — (“Some idiots call my work abstract, in spite of the fact that what they call abstract is actually the most real of all — not the outer appearance, but the concept or essence of things”). I quite liked the comment about abstract! 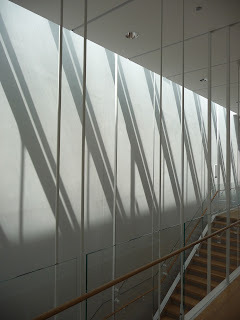 I am thinking along the lines perhaps of how Jesus Christ can be considered spiritually today. His Public Life and Death for us might well be considered in that light. Certainly has given me food for thought!